In 1946 Judy Garland "went to spend a jolly hour on the trolley." In the mid 1930s it was a common thing to spend several hours riding the trolley. During the summer months a part of the trolley car's sides were taken off and replaced by thick wire guards. This enabled the passengers to have a much cooler ride. Of course there was also a drawback. When it was raining, the trick was to sit away from the rain side or stand. On hot summer days we, meaning family and neighbors would wait till it was almost dark and then set out for our big adventure. 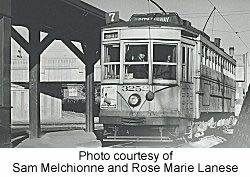 Children were allowed to walk four blocks to the end of the line and board the trolley there. The adults would wait at the trolley stop and then board the same trolley we were on. The business day was over, the trolley was mostly empty and we had our choice of seats. The #27 Mt. Prospect is the line we rode. It went "down town" and ended up in what was called "North Newark" and sometimes "The Mt. Prospect Section." At the end of the line the motorman would walk to the other end of the car, changing the position of the seatbacks as he walked. The trolley had controls at each end and so the motorman now started the return trip operating the trolley from a different end. We would arrive back at the starting point about two hours later ready for bed after our wild night. The cost of the trip was .05¢ each way. For .30¢ my mother was able to cool off and find relief from overseeing my sister and I, who had a night of adventure. All things considered, not a bad deal. In later years, when trolleys were replaced by busses, I don't recall anyone ever going for a bus ride. If they did, Judy Garland didn't sing about if.